A better book for Christians than for Skeptics? 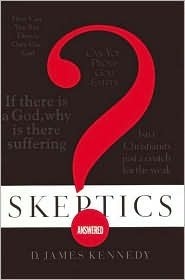 D. James Kennedy's Skeptics Answered is a really good way to answer some of the questions that skeptics raise for Christians, but it may not equip Christians so well to answer the skeptics themselves. Why the difference? The reason has to do with Kennedy's stress on evidence and optimism about the possibility of "honest" skepticism. The book begins with Kennedy's insistence that "Skeptics Are Welcome" (the title of Chapter 1). Kennedy does clarify that it is God who makes a skeptic honest, by quoting 2 Timothy 2:24-26, in which Paul reassured Timothy about his opponents, "that God may perhaps grant them repentance, so that they may know the truth." However, Kennedy often quotes people who claim to have done impartial and unbiased investigation of the truth about Christianity. Kennedy begins his investigation well by starting with the Bible, stressing the reliability of the word against skeptics' attacks. God Himself tells Israel that fulfilled prophecy is a crucial way to know if a prophet is speaking in the the name of the LORD (Deuteronomy 18:21-22). The Bible includes hundreds of prophecies fulfilled both by world events and, especially, in the life, death, and resurrection of Jesus Christ. The first part of the book concludes with a look at the use (and misuse) of logic in spiritual matters. The effective middle part of the book deals with the existence of God and of Jesus Christ in history, the divine identity of Jesus, and (in perhaps the most intriguing chapter) the testimony of even unbelievers to the greatness of Christ. The first chapter of the last part of the book gives a positive answer to the question "Is Jesus the Only Way?" by showing the many ways in which Christianity is unique. Less effective, both Biblically speaking and in the opinion of some of the skeptical reviewers on amazon.com, is Kennedy's discussion of the problem of how a good God can allow evil and pain to exist. The problem is that on this issue - God's character rather than some abstract issue of a hypothetical God's existence - skeptics are decidedly not honest, impartial, or unbiased. Nor should we expect them to be. Without the work of the Spirit, "no one seeks for God.... There is no fear of God before their eyes" (Romans 3:9-18). This is where Kennedy's evidential apologetics wears thin. Evidential apologetics seeks to prove the truth of the Bible by bringing up supporting facts for "honest" skeptics. It can be useful to clear away stumbling blocks for spiritually weak Christians or non-Christians in whom the Spirit is already working. For your average argumentative skeptic, presuppositional apologetics is more appropriate - exposing the assumptions that even atheists share with Christians. All people implicitly know that God exists and that His law applies to all of us, as Paul reminds us in Romans 1 and 2 - even if, by nature, we also all reject or deny His existence or rule. It is entirely fair, then, to ask critics of God's existence or goodness how they know what existence and goodness are. The final chapter of the last part also shows the weakness of evidential apologetics - "Is There Life after Death?" Kennedy's marshaling of near-death experiences from history is undermined by the (correct) warning that such experiences must be judged by Scriptural criteria. This, of course, makes no sense if the purpose of such testimonies is to reinforce the Scriptures. The Bible does not need such reinforcement, nor will it be effective. As Christ warned in the parable of Lazarus and the rich man, "'If they do not hear Moses and the Prophets, neither will they be convinced if someone should rise from the dead'" (Luke 16:31). One final note from the skeptics on amazon.com: Some felt that Kennedy's tone was condescending toward non-Christians, and his presentation may indeed be lacking at times in "gentleness and respect" (1 Peter 3:14-16), which may diminish its usefulness as a tool for witnessing to unbelievers. In spite of the weaknesses described above, the "back of the book" ends strongly with a presentation of the "Good News" in the Epilogue, as well as a Study Guide for each chapter. Kennedy's book may or may not help you answer skeptics, but it still provides answers (for yourself or other believers) for some of the most common questions that skeptics raise in Christians' minds, and you can get Skeptics Answered here.